Just received word that Kousa: A New Dogwood's in Town will be in Sandra Sider's upcoming publication: The Studio Quilt, no. 6: State of the Art. A detail of the quilt is shown here. Originally planned for 30 artists, Sandra is including 60 because of the great response and quality of the submissions she received. This makes four books that will carry some of my work in the coming 12 months. The first out will be Susan Brubaker Knapp's book. Point, Click, Quilt! coming out next month. Susan's book will feature her extraordinary work, projects using her techniques, and a gallery photos and art work from other artists who use photos for imagery for their quilts. 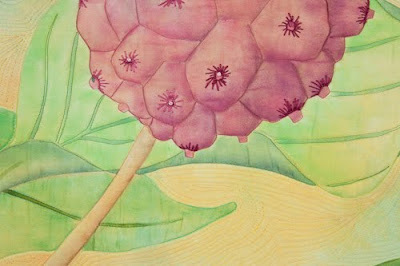 Martha Seilman's book: Art Quilt Portfolio; The Natural World will be published in 2012. She selected me for one of the featured artists for the book and it will include both an interview and discussion of my work, my inspirations, my work processes and several of my quilts. I am very humbled by this terrific honor. The last book will be the next publication of SAQA's Portfolio series of work by the Professional Art Members. It will be available as an on-line e-book on the SAQA site and as a printed book. This should be out in October 2011. Inspired by a small handwoven pincushion from one friend and a credit card/cell neck wallet by another friend, I began playing with some small cardboard loom handweaving. As you can see by these photos, I've gotten a little obsessed -- maybe because it's so portable or easy or mindlessly soothing. I started with some simple "intro to weaving for children" info on the web, like that found here http://www.biglearning.com/article-cardboard-loom.htm. Here's my starting loom: a cardboard insert from an old 5"x7" photo frame, notched with scissors every 1/8", and warped with pearl cotton. 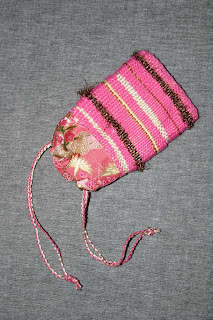 A small (about 4"x6") not-yet-lined bag woven from leftover acrylic yarns.